Willie Lumpkin is the semi-famous mailman for the Fantastic Four, and was even portrayed in the first FF movie by Stan Lee himself. The character debuted in Fantastic Four #11 circa 1963, written by Lee and drawn by Jack Kirby, where he submitted himself for any ear-wiggling services the FF might need. It's a little hard to read here, but the stamp cancellation in the strip's masthead notes Willie Lumpkin's location as Glenville. The name actually was used repeatedly throughout the strip as well. What's interesting about that is that Glenville was the town later named by Lee as the hometown of Susan and Johnny Storm, half of the Fantastic Four team that Lumpkin would later serve. 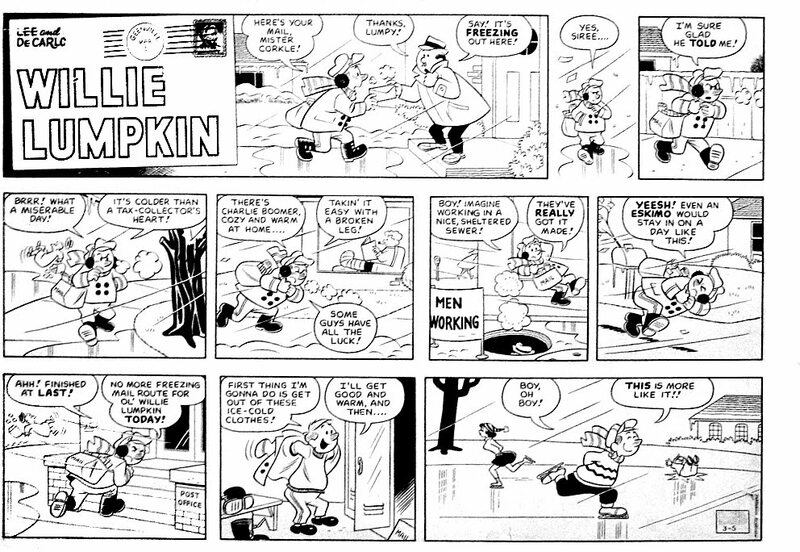 Though the age progression of Lumpkin himself would suggest that the strip occurs well before the two superheroes were born, it's possible that one could find likenesses in the strip that bear more than a passing resemblance to their parents, Franklin and Mary. 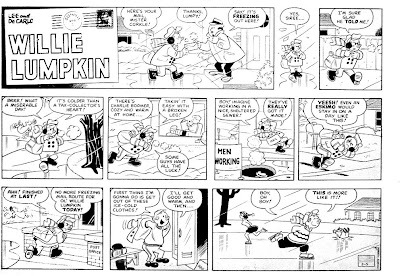 The strip lasted barely a year, most likely because it didn't stand out from other newspaper strips of the time. It's largely only notable now because the two creators went on to make big names for themselves in comic books and one of them reused some of the material in his more famous works. That's pretty good stuff, at least judging from these samples. I particularly like some of the humor in the big (Sunday) strip. "Yes, siree... I'm sure glad he told me!" That's hilarious. Also, a funny thing about comic chronologies: if we imagine Willie as, say, 30 in the 1960 strip, he would originally have been too young to line up with the Willie Lumpkin who met the FF two years into their adventures... yet with the sliding date of the team's origin (maybe the late 1990s if we judge by their ages in 2010) a Willie Lumpkin born in 1930 will arguably be too old soon, if he isn't already! Kind of like how kids go away to boarding school on soap operas and come back a few years later as adults? (In comics of course, they usually rely on time travel rather than boarding school for that.) Heh.